What is the Importance of House Rewiring? House rewiring or electrical rewiring is the process of replacing old, inefficient, hazardous, or unreliable electrical system. House rewiring provides an improvement to the performance of the electrical system and ensures electrical safety. There are several factors that determine when you need a house rewire. Ideally, a properly installed electrical system can last as long as 20 years but the use if the electrical system and type of wiring can affect its lifespan. Old homes usually require electrical rewiring because most installations have been worn out or are outdated. House rewiring is a major task in many ways. It is costly and requires time and expertise of a professional electrician. The importance of undertaking a house rewiring project is much more than electrical safety and reliability. Here are some of the major benefits and importance. Having a home rewired increases its value in the event of a sale. It is a big plus to know that the home’s electrical system is fully modified and safe. A house should be seen as an investment especially when you are a property manager. Electrical rewiring makes the home appealing to buyers, tenants, investors, and so on. An electrical rewiring project gives you the best opportunity to make your home technology friendly. You can change old and worn out parts to be replaced with modern, up to standard parts. You can also determine the ideal spots you want sockets or outlets to be placed. An electrically optimized home offers maximum comfort, convenience, and safety. It provides dedicated circuits to most appliances, more control, and energy saving options for the home. Safety is the primary reason for a house rewire. Old or faulty wiring can develop to larger problems that put life and property at risk. Electrical safety is crucial in every home. Hence it is advisable to call an electrician from The Electric Connection to inspect or provide rewiring services. Some appliances can demand more power than your house is wired to offer. If you have one or more of such new appliances, then it is important to hire an electrical technician for a rewiring service. This will prevent any strain or damage to the present system. An old house wiring may not be updated with the latest electrical codes and standard. Rewiring the home presents the opportunity to install systems that keep these standards. An experienced electrician will be able to rewire your home with knowledge on the current codes and standards. A lot of people take the electrical system for granted despite its importance. To avoid accidents or dysfunction in the home, it is best to take the necessary precautions. A house rewire is a worthy investment but it can only maintain its value when provided by a licensed electrician. At The Electric Connection we are professional, licensed, and experienced electrical technicians. 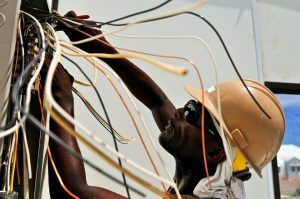 Contact us for your home’s electrical rewiring. We ensure that everything is optimized and organized the first time.